Setting up the Linksys WUSB6400M AC1200 MU-MIMO USB Wi-Fi Adapter is quick and easy using the Plug and Play Setup. But if the Setup Utility fails to install the driver, you can update it via the Device Manager. Choose from the options below to solve the failed driver installation. 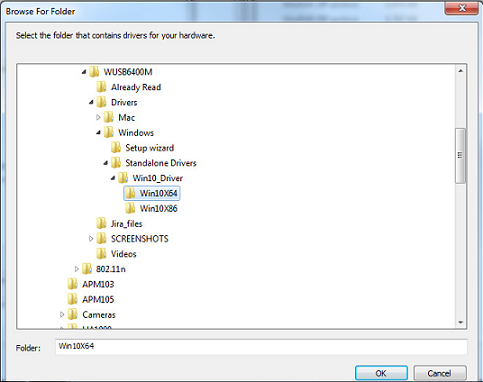 Before you begin, locate the driver of your Windows® operating system on your Setup CD. If you lost your Setup CD, you can download the Setup Utility from the Linksys WUSB6400M Download page. Take note where the driver is located or saved on your computer. Go to Device Manager. To know how to access the Device Manager, click here. NOTE: If there is a problem with the device driver, it will appear as partially installed under Other devices with an exclamation mark. Right click on the wireless USB adapter and select Update driver Software. 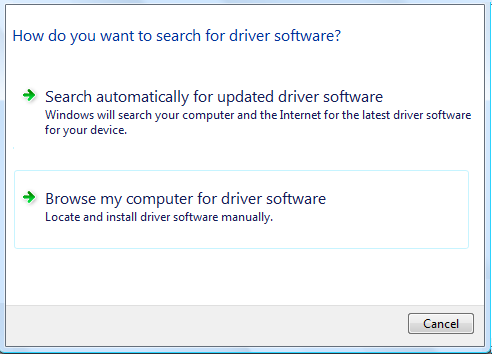 Click on the Browse button and locate the driver for your operating system. Then, click OK.
Once the driver has been installed, the wireless USB adapter will appear under Network adapters. Right click on the wireless USB adapter under Other devices. NOTE: If the driver failed to install or no drivers were detected, your computer needs to access the Internet to check for updates. If your computer has a built-in wireless adapter, make sure that adapter is connected to a Wi-Fi network and try these steps again to install the driver for the Linksys WUSB6400M.